Hands On with the Nintendo Switch! This blog was originally written and posted for The Glux Blog. Woo what a weekend! 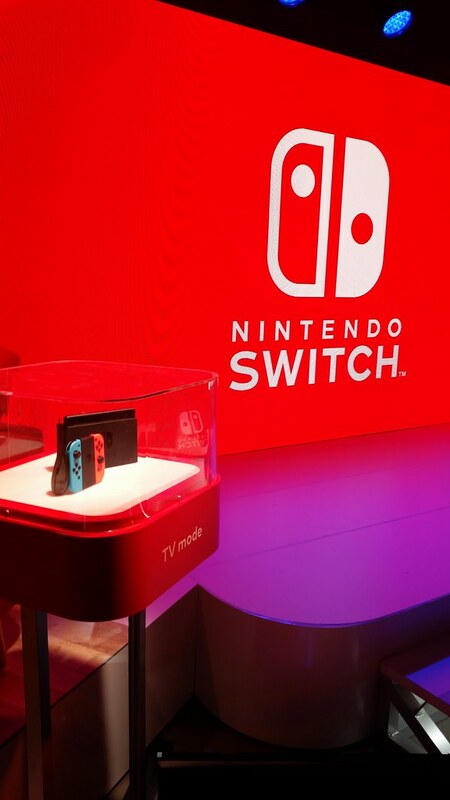 Everyone has been talking about the Nintendo Switch ever since the presentation last Thursday, which introduced the system and showcased the new Joy Cons – the convertible controllers that come with the Nintendo Switch system. But I felt lucky because I had a ticket for the Nintendo Switch Preview Event in NYC! 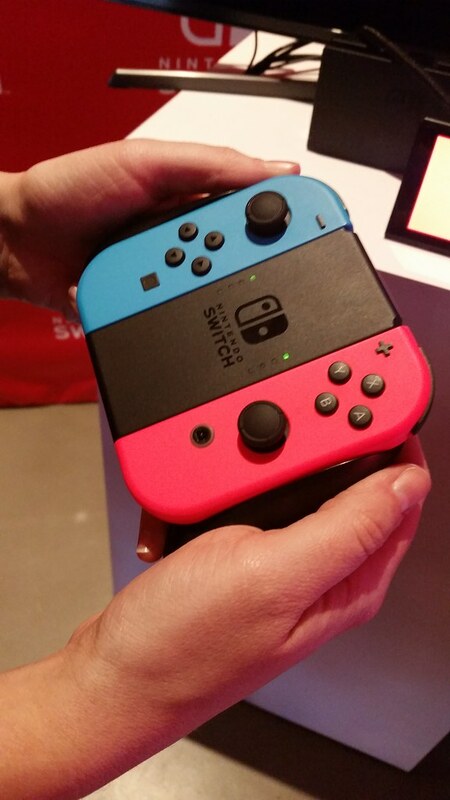 I was able to get a hands-on demonstration of the Nintendo Switch system, the Joy Cons, software and more! The event was held at a secret off-site location in midtown, open only to invited ticket holders. (I was able to get a ticket by logging into my MyNintendo account when they first announced the event. This apparently triggered an event invite to be sent to me at the time. So what have we learned? Log into MyNintendo once in a while!) I went with one of my besties, CarneyVorous. We braved the cold wintery weather and it was SO worth it! As we approached the entrance, we were surprised to see that Link from Breath of the Wild was guarding the door. Well, Link and a dozen event coordinators. Everything was very organized, which was nice. They checked our tickets and finally after long last… WE WERE INSIDE THE SNEAK PREVIEW EVENT! The event consisted of two large rooms. 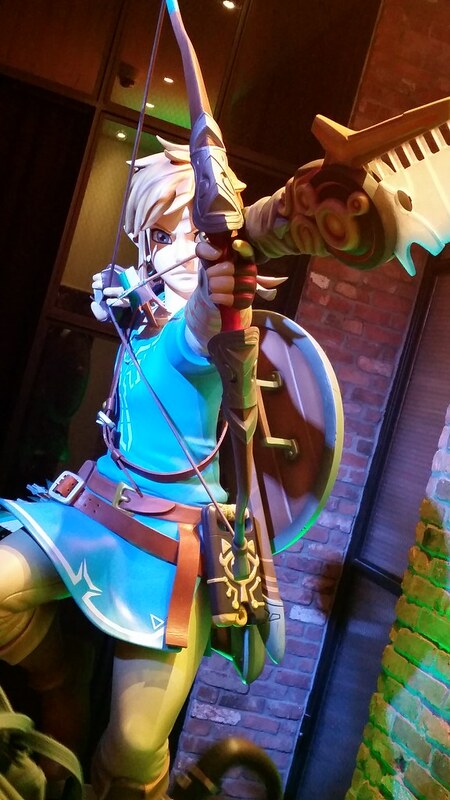 The first room had a glamorous setup with a main stage, glass windowed demo cubicle setups, and a third of the room dedicated to Legend of Zelda demo stations. 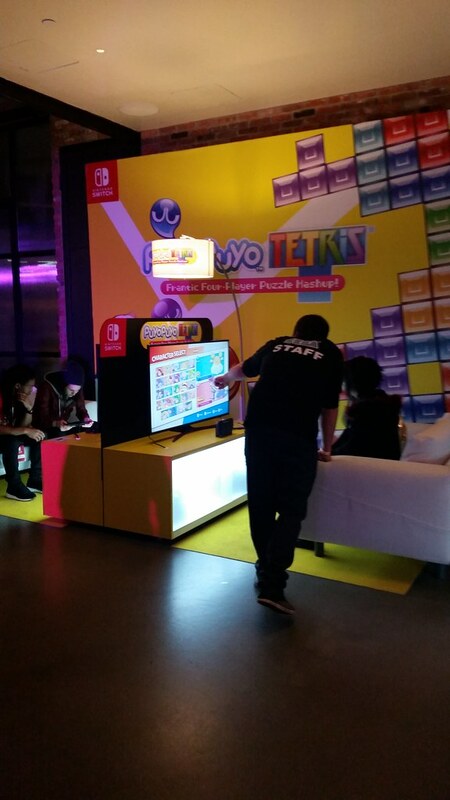 The second room had a huge area dedicated to Splatoon 2 demos, as well as third-party titles and a Super Mario Odyssey photo-op station! It was a lot to take in. We didn’t even know where to start! Sadly, the Zelda line got ridiculously long in a short amount of time, so we decided to make the most of our time by trying as many fun demos as we could. Splatoon 2 on the Nintendo Switch in hand-held mode. 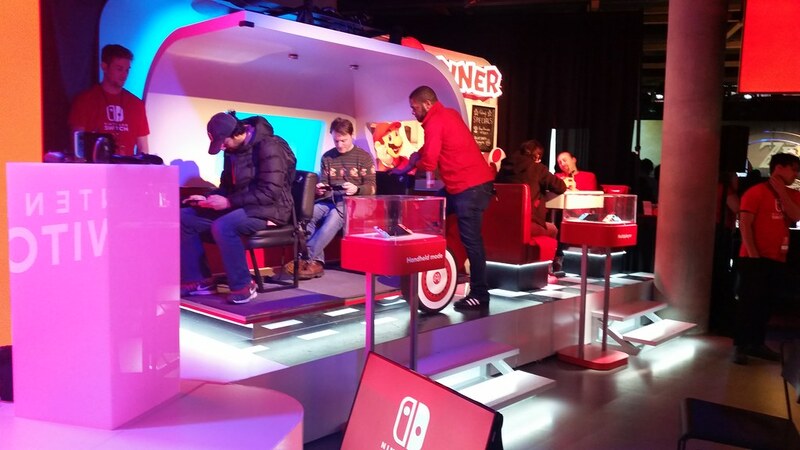 Next, we wanted to get an up-close look at the Nintendo Switch Joy Cons by checking out the glass cubicle 1-2-Switch Demo Stations! The 1-2-Switch game utilizes the Joy Cons in a way that showcases all of the new features it has to offer, including HD Rumble technology. This game is unique in that you don’t really need to look at the screen to play – it’s all about playing with other people, making eye contact, interacting with humans… you know, scary stuff. The 1-2-Switch Demo consisted of Quick Draw, Milking Cows (yep) and Counting Marbles. 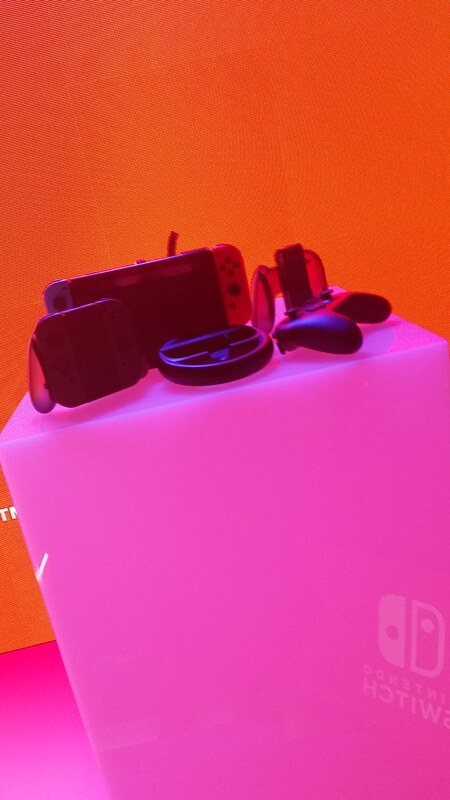 Each game showed a different feature of the Joy Con controllers. 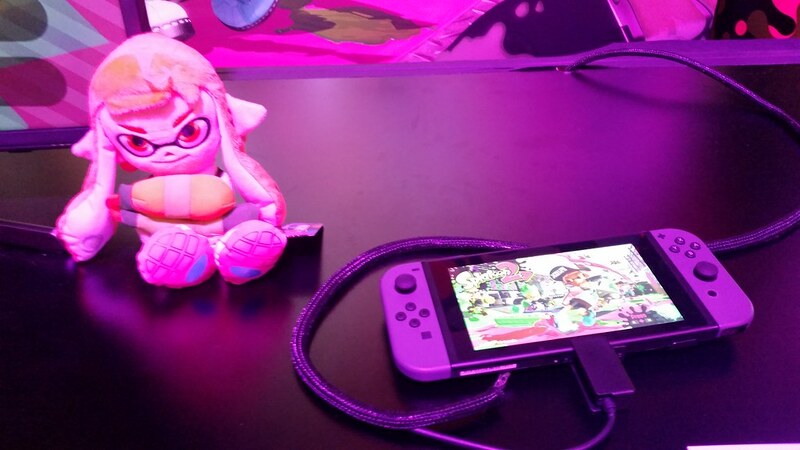 I will note that the Nintendo reps insisted on using the wrist straps with the Joy Cons for this game. Very sensible – and side note! – the wrist strap adds an extra half inch of width to the controller, which makes it even easier to hold. Quick Draw showcased the Joy Con’s basics, such as motion control. Milking Cows introduced new ways to feel awkward around your friends (because yes, the game is exactly what you think it is) and also makes use of the L and R buttons that have been incorporated into the new controllers. Counting Marbles was the most interesting game in the 1-2-Switch Demo, because it featured the new HD Rumble effects. The Joy Con simulated the feeling of small marbles rolling around inside of it (and does an EXTREMELY CONVINCING JOB doing so) and you have to guess how many marbles are “inside.” You determine this by moving the Joy Con and “feeling” the marbles sliding around and clicking against one another. It was pretty amazing! The HD Rumble is very responsive and I am very interested to see how other games will incorporate this new technology. One of my all-time favorite games has always been Mario Kart. I would play after school with my friends on the N64 back in the day, and I haven’t stopped since! Playing MK on the go has always been a strong selling point… so being able to play MK8 Deluxe in full HD while on the move is going to be AH-MAY-ZING! 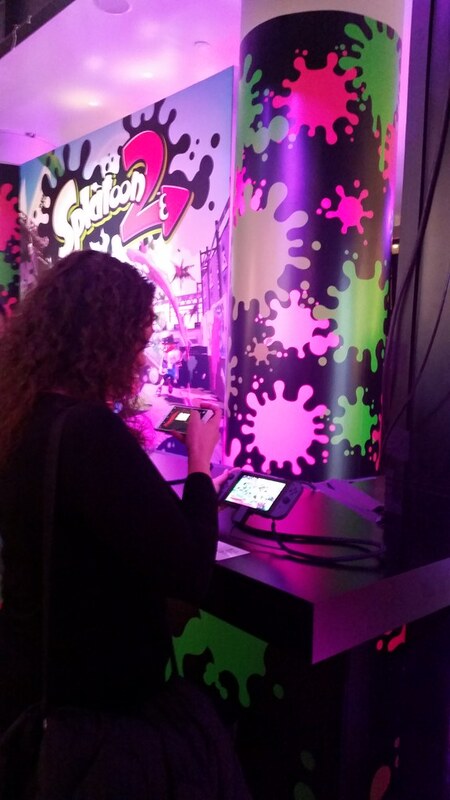 To give us the full experience, Nintendo set up some fun ‘simulation’ demo stations. In the picture above, you see a fake diner with demo stations, as well as some guys in what looks like an RV? Or some kind of van? Playing MK8 at “the diner”! Here I am “at the diner” enjoying some MK8 Battle Mode in handheld mode – which I won with Bowser, btw! It’s great to have some authentic battle mode back in the mix. We also tried out a demo station that was set up to look like we were playing on an airplane. (Awesome idea!!) 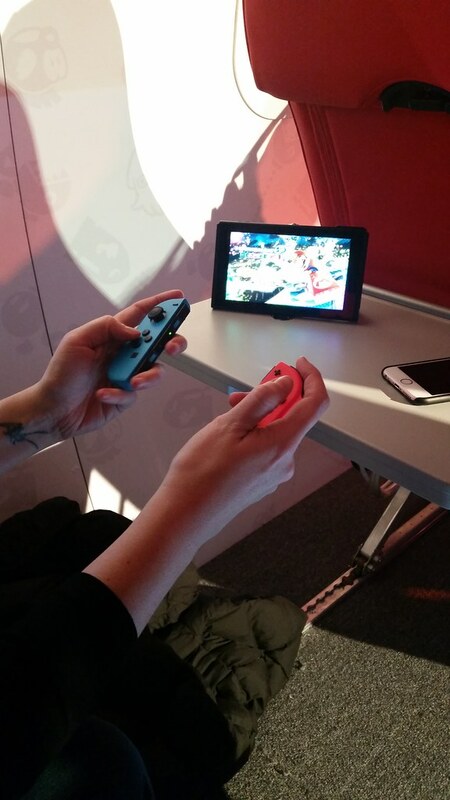 They set up the chairs to have those awful tray tables, and placed the Nintendo Switch in tabletop mode for us to play. 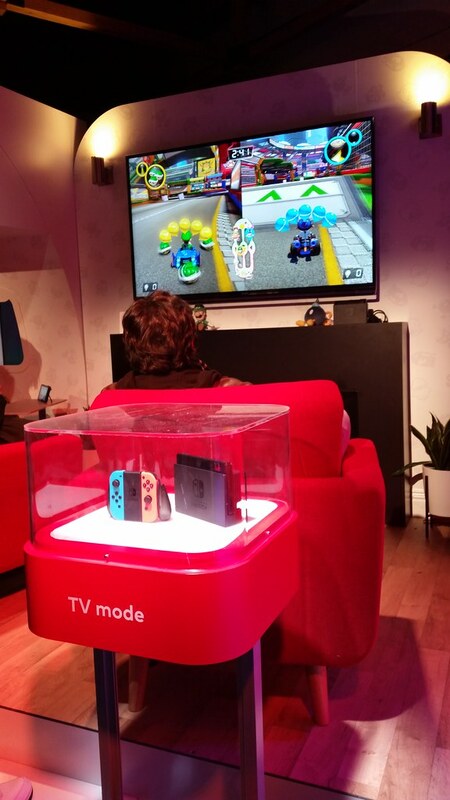 Tabletop mode is when you have the screen standing up with the kickstand, and the Joy Cons are removed from the sides so that two people can use them and play while watching the screen. 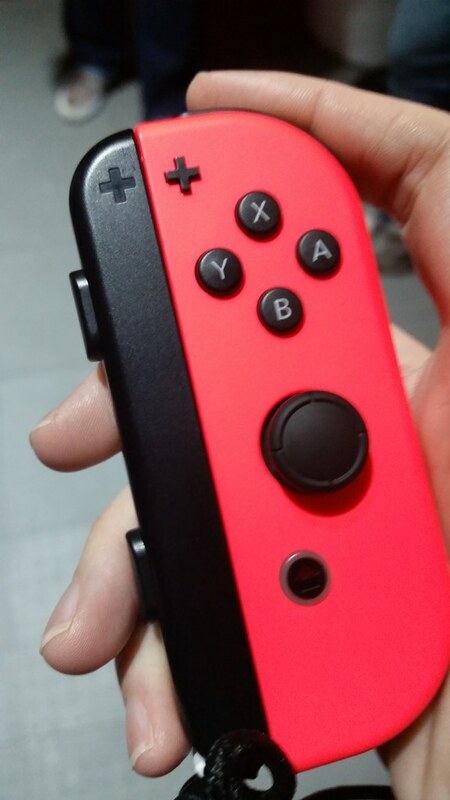 I will say that as a veteran MK player, I did not mind the Joy Cons for this game. Yes, if you’re using the Jon Cons, it is a small controller. Like I mentioned before, the wrist strap helps a lot with that issue. It takes some slight ‘getting used to’ but it’s not bad at all, and having usable L and R buttons meant that my game play was as good as ever! 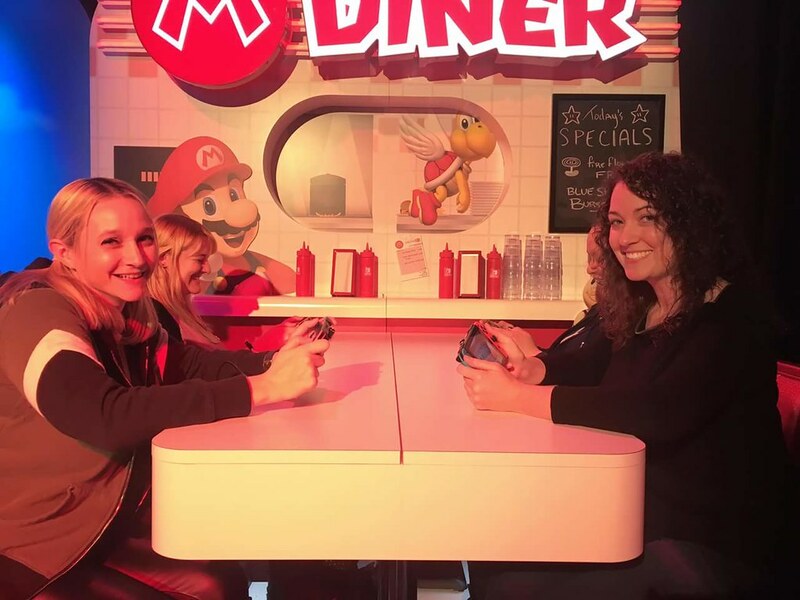 Please note that in this side photo, we were also trying out Mario Kart with the Joy Cons in what I am calling “nunchuck mode,” which is similar to the old Wii nunchuck and Wii Remote setup… without that cumbersome cord connecting them together! You can play with the Joy Cons as nunchucks, yet sit however you prefer, so that you can play comfortably. So much easier! Imagine how much better air travel will be when you’re challenging the random stranger sitting next to you to a Grand Prix! 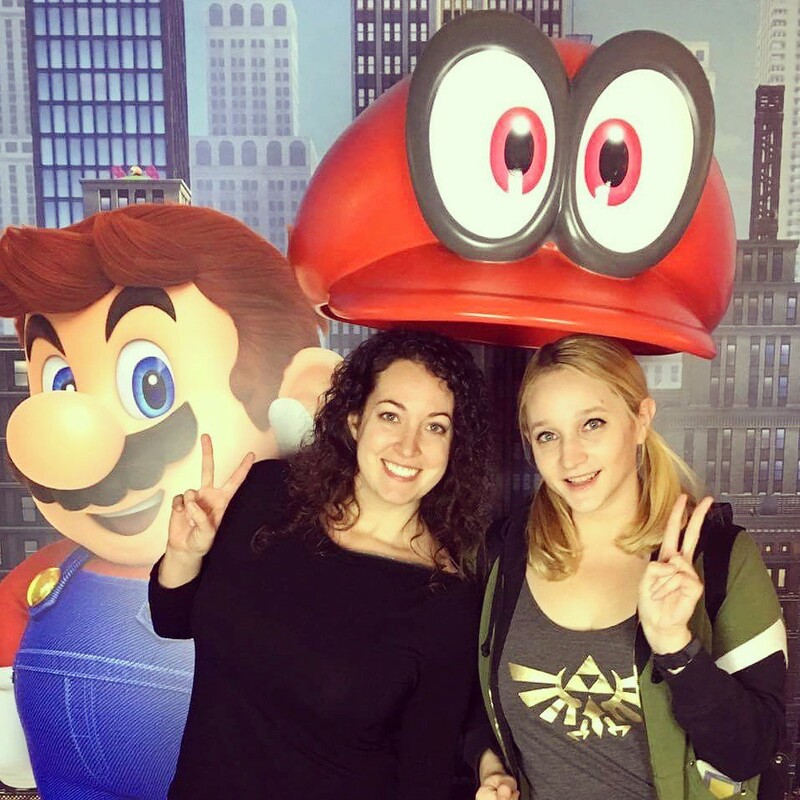 Super Mario Odyssey Photo Op!